I’ve known Mato Nanji since the late 1990s. Indigenous had released “Things We Do” and they were playing the Sioux Empire Fair with another young blues guitar slinger named Jonny Lang. I’ve followed Indigenous’ career ever since in part because they are South Dakota natives and part because I just love the music. I got a chance to talk to Mato before their recent concert at the Hard Rock in Sioux City to revisit the past, talk about songwriting, future plans for recording with some of his Experience Hendrix mates and even the relaunch of Indigenous starting this November as Mato takes a fantastic New Mexico blues band that you’ve heard on the Blues Fix at 6 called the Plateros, and morphs them into the new Indigenous. DECATUR – Growing up on the Yankton Sioux Reservation in South Dakota, Mato Nanji said classic American blues were not exactly the most popular form of music around. Most of the Native American residents listened to country if they listened to popular music at all, which made Nanji's deep appreciation for the blues all the more unusual. It was thanks to his father, the pioneering leader of a 1960s blues band called The Vanishing Americans, that Nanji was exposed to music in the first place. With his father as his idol, the sound of the blues took hold of him and has never let go to this day. Formed in 1998, Indigenous became the family band's next generation. Mato was the frontman, joined by his brother Pte, sister Wanbdi and their cousin Horse on drums. In the late 2000's, the other family members went their separate ways, but Mato Nanji played on and built himself a new band to continue his signature blues-rock sound. Likewise, leaving the “family band” format behind and striking out truly on his own helped Nanji step forward as a band leader. He still finds new inspiration in the blues, admiring the genre's focus on emotional intensity and a lack of reservations and self-awareness while performing. Outside of Indigenous, the guitarist has also kept busy as a member of the annual Experience Hendrix Tour for more than a decade. It's just another opportunity to play the blues for Nanji, who said he believes the genre is still vital but has become more fractured, fully permeating other styles of popular music. Ultimately, it's the live shows like Thursday night's Blues in Central Park appearance that Mato lives for. He's simply a born entertainer, someone who has known exactly what he wanted to do for a living ever since he was a young boy growing up in a South Dakota Native American reservation. It's easy to envy the self-assuredness with which he pursues his passion. Guitarist/singer Mato Nanji is the frontman for power blues trio Indigenous, which will perform May 1 at the Armory in Janesville. JANESVILLE—It's a long way from the Yankton Sioux Reservation in South Dakota to Washington, D.C., where guitarist/singer Mato Nanji performed at the American Indian Inaugural Ball in January 2013 to celebrate the re-election of President Barack Obama. The contrast between a rural Indian reservation and the opulence of Capital Hill is symbolic of Nanji's musical journey since the blues-rock band Indigenous burst onto the national scene 15 years ago. Now an award-winning band at the forefront of American blues music, Indigenous will appear at the Armory on Thursday, May 1. The band features Nanji on vocals and lead guitar, Derek Post on bass, guitar and vocals, and Charles Sanders on drums. 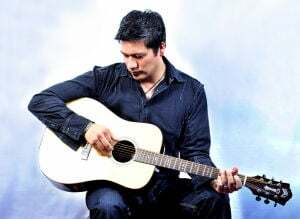 Guided by his musician father, Greg Zephier, Nanji formed Indigenous with his brother, sister and a cousin in the early to mid-1990s, while the four were still teenagers. Nanji said the group practiced for a solid year before playing for an audience. Indigenous released its debut album, “Things We Do,” in 1998. The next year, it won three awards at the Native American Music Awards, including album of the year and group of the year. The record also produced a single, “Now That You're Gone,” which peaked at No. 22 on Billboard's mainstream rock chart, making Indigenous one of the first American Indian bands to achieve that level of success. 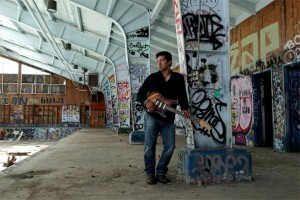 Amazon.com named the band blues artist of the year, and Indigenous was featured on a host of national television and radio programs. Blues icon B.B. King became a self-proclaimed fan and invited Indigenous to join his Blues Festival Tour. Indigenous has had two albums that reached No. 3 on Billboard's top blues albums chart. The band's 2006 release, “Chasing the Sun,” peaked at No. 2. Nanji said a personal highlight came in 2002 when he was invited to join the Experience Hendrix Tour, a month-long series of concerts featuring some of the country's top blues guitarists performing the music of Jimi Hendrix. Native American rocker Mato Nanji of the powerful blues group, Indigenous, began embracing the blues and utilizing his musical talent at a young age, as he was influenced heavily growing up by his blues musician father and his native culture. Now, with his 9th commercial record release, Vanishing Americans, Mato can be proven to practice what he preaches – hard work and sincerity certainly pay off in the music business, and yet, oftentimes, are the most difficult aspirations to hold on to. Jill Jacobs caught up with Mato as he was traveling in the mountains on the west coast for their current U.S. tour, during which Nanji discussed everything from the album process to inspiration to expert advice for an amateur music business dreamer and seeker. Vanishing Americans is your 9th studio album. How is this album different from the others, and what did you do to prepare for this album? How would you say that your Native American culture impacts your music, as a songwriter and as a musician?